All Great Neck Library locations will be closed on Monday, Feb. 18 for Presidents’ Day. An AARP Driver’s Safety Course will be given on Saturday, Feb. 16 from 10 a.m. to 4:30 p.m. at the Parkville Branch, 10 Campbell Street (off Lakeville Road), New Hyde Park. This is a refresher driving course for drivers ages 50 and over for reduction in points or discount on insurance. This is a six hour class; please bring your lunch. AARP member fee: $20.00; Non-AARP member fee: $25.00. Checks only. Registration is ongoing by calling 466-8055, ext. 273. Join Librarian Mimi Rabizadeh in this ongoing spiritual discussion on living creatively and accessing your higher consciousness. The next discussion will be held on Tuesday, Feb. 19 at 7 p.m. in the Large Multipurpose Room of the Main Library, 159 Bayview Avenue. Registration strongly suggested by calling 466-8055, exts. 218/219, or register online. AARP Tax Preparers will assist in preparing and filing simple Federal tax returns online only on Wednesdays from 10 a.m. to 2 p.m. (last appointment 1 p.m.) and continue every Wednesday through April 10, 2019 at the Parkville Branch, 10 Campbell Street (off Lakeville Road), New Hyde Park. You must have an appointment and bring all relevant tax papers, including a copy of last year’s return, photo identification, copies of Social Security cards for all individuals on the tax return, all tax related forms (example: W2, bank statements, real estate statements, etc.) and a canceled check. Call 466-8055, ext. 273 for further info or to make an appointment. The next Wednesday Matinee, a musical romantic comedy about a daughter who reflects on her mom’s journey, and finds herself to be more like her mother than she ever realized, will be shown on Feb. 20 at 2 p.m. at the Main Library, 159 Bayview Avenue. The next encore film, a musical romantic comedy about a daughter who reflects on her mom’s journey, and finds herself to be more like her mother than she ever realized, will be shown on Thursday, February 21 at 2:00 p.m. at the Station Branch, 26 Great Neck Road (2nd level), above Best Market. 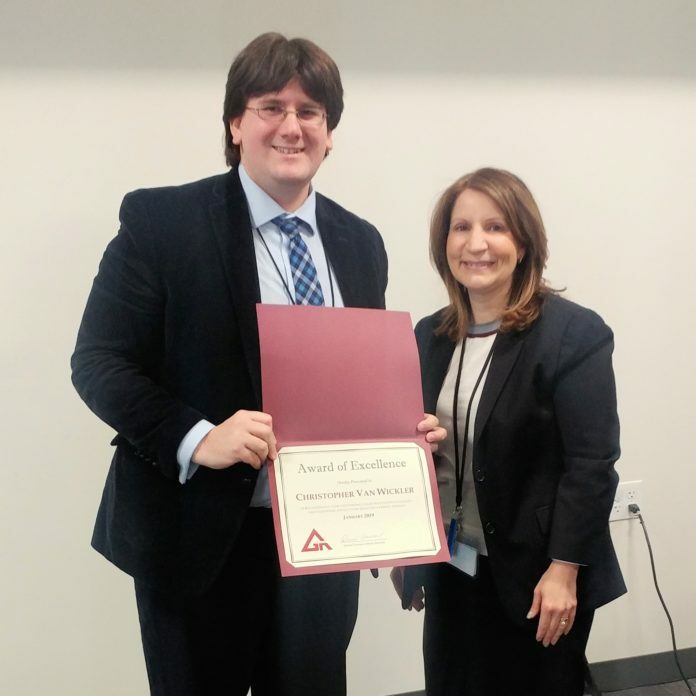 Christopher Van Wickler is the recipient of the Great Neck Library Staff Excellence Award for January 2019. Chris was recognized for his outstanding collaboration with colleagues and exceptional service to the Great Neck Library patrons. The 2019 Library Election will be held on Oct. 28. There will be two seats expiring in January 2020 – one on the Board of Trustees (Scott Sontag) and one on the Nominating Committee (Patrick McDonnell). Any nominee for a position on the Board of Trustees or the Nominating Committee must be a member of the Great Neck Library Association by the Record Date of Oct. 7, 2019. All persons 18 years of age or older, who are residents of the Great Neck School District and are either valid library card holders or registered voters with the Nassau County Board of Elections, will be members of the Association. Library patrons connected to the Internet are asked to check the website: www.cancellations.com for Library weather related closings/program cancellations. In order to access this service, Library District residents can log on to cancellations.com, type in their zip code or Great Neck Library and obtain information on program cancellations or Library closings. In addition, at no charge, residents can request automatic e-mails from cancellations.com when the Library has posted any information. This is a way for Library District residents who are connected online to be advised of weather related changes in Library hours or programs.